Quick and easy sushi bowls are a versatile meal that can be made for omnivores, vegetarians or even vegans. 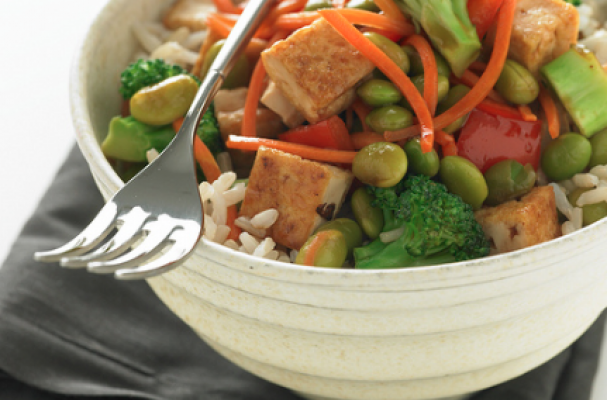 Tofu or fish is set atop a bed of rice and served alongside an array of vegetables. This meal as easy on the wallet but you will still fulfill your Japanese fix. Step 1: In a small bowl, combine tamari, rice vinegar, honey, garlic and ginger and whisk until well combined. Marinate the tofu or fish for 30 minutes. Step 2: Prep the vegetables and cook rice while tofu or fish is marinating. Step 3: For tofu, heat unflavored oil in a non-stick skillet over medium-high heat. Add tofu and cook until browned. For the fish, heat about a tablespoon or two in a non-stick skillet over medium-high heat. Place filet skin side down and cook for 5 minutes. Turn the fish over and cook for an additional minutes or two. Same the remaining marinade and pour into the pan once fish or tofu is finished cooking. Let reduce slightly and pour over the cooked tofu or fish once arranged in the bowl.